Yes, voice in my head. It would be brilliant. And it is. So: to celebrate, we’ve gathered some of the team to talk through what Planetside 2 is really like: good and bad, what works and what doesn’t, and what you should really pay for. Men! Let’s start with a bit of background. 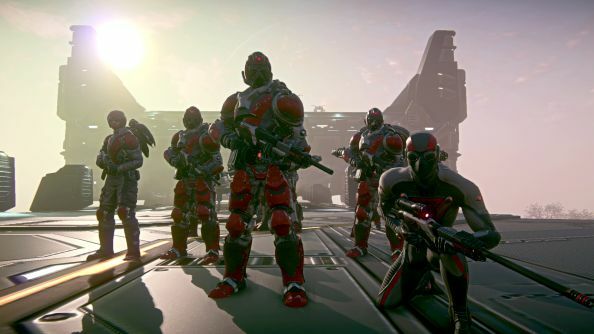 What’s your experience with the Planetside series? Julian: The original Planetside was released when I was but a tiny, so convincing the parents for a subscription wasn’t an option – especially as their monthly tithe would go to be me shooting people from all over the world (not their idea of multiculturalism). Despite this, I read everything I could find on the game; players of the original Planetside often talk about the way it generated war stories – events which arose unplanned out of the freedom of the game – and these were great novellas. Learning about one small squad’s desperate defence of an outpost, or a tank column suffering a Charge of the Light Brigade-esque destruction after an ill-advised push into enemy territory, was my link into the series. Tim: I played the original a load, back when having 256Mb of RAM was known as “Holy cow mate, chill out there.” Planetside 1, if I remember correctly, needed 512. It was basically amazing: it came out just as I was starting to work on PC Gamer. Good times. Nick: I didn’t actually play much of Planetside, but I happily watched a few mates who did. As Tim mentioned above you needed some pretty tidy system specs to even run it at a competitive level. I would just get caught up in all the action, orders were being barked left right and center. In a way I’m quite surprised it has taken this long for a sequel to emerge. When I saw Planetside for the first time, I just assumed this was how FPS’s were going to be made in the future. So: what did you want to get out of it? What were you hoping it was like? Tim: First of all: pretty. The original game was a system killer – we haven’t had a game that stretched PCs for a good while. The second point: it had to feel like a good shooter. Weapon feel has come a long, long way since the original game. For me; all of its scale didn’t matter as long as it felt as good to shoot a gun in Planetside 2 as it does in Battlefield 3. That, and really, really big fire-fights. Julian: I wanted scale. Planetside’s schtick was that it was the only MMOFPS out there. That it wasn’t repeated till now shows something of the complexity that involves, the difficulty of coping with thousands of players loaded up with machine guns and driving missile-touting vehicles. Because I didn’t get in on the first game I’d never first-hand witnessed a fight between hundreds of virtual soldiers. I wanted that: to see the biggest battles in gaming. Nick:I’m just greedy and wanted both eye candy on a huge scale. 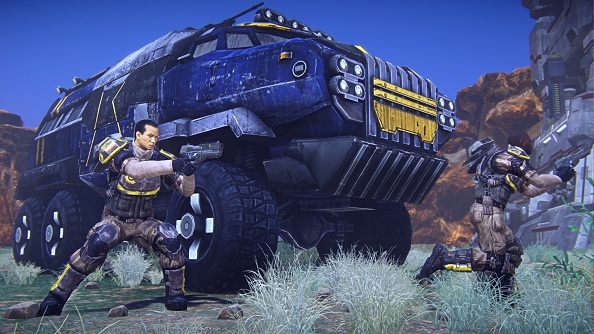 No one wants to be fighting a huge war with cardboard cutouts, but no one wants to ignore the scale that made Planetside special either. Synergy is also important to me, giving each class and vehicle a place on the battlefield. I want my tanks to take out their AA while my Galaxy’s drop troops. I want my Liberators to shell the enemy armour while smaller craft protect them. Jules: Yes! I’ve seen things, man. I’ve seen aircraft swarming the sky, streaming bullets and missiles into one another, above an infantry assault on an outpost, while defender’s man turrets on the walls holding out for tank reinforcements. It was genuinely astounding, I’d never seen anything like it in gaming. I’ve played a lot of Battlefield and, while the visual fidelity may be higher, it’s 64 players are nothing compared to Planetside 2. So, on the scale front, yes, Planetside 2 absolutely delivers. Considering it’s free, it’s worth installing and playing it now for that alone, just to see it. On other fronts, particularly compared to Battlefield, I feel it is a little weak. Though, we’ll be getting into that soon. Nick: It’s a bit early to tell, but I have had some magic moments while playing the beta with a few good friends. Having booted up the launch client the performance is almost god like compared to the beta, which is a good start. Right now I’m trying to convince everyone who lives under a rock to pick it up and try it. Especially those that consider Battlefield to be the end all of large scale combat. This is still the closest thing to all out war, there is no denying it. Tim: Stuff that goes boom! This is the trouble with Planetside… you start writing about it, and you’re already off telling stories. It’s impossible not to. Sometimes, that’s a problem. Tim: The scale and the pretties mask some problems. Mainly, I worry about how players are organised in-game. 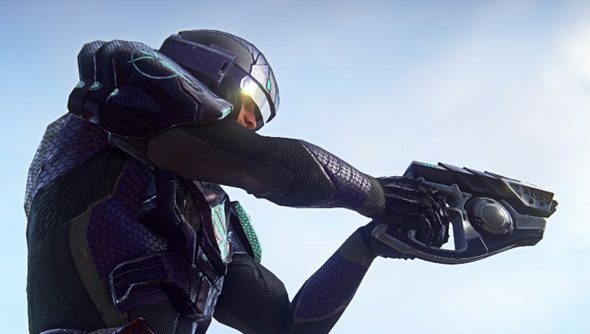 There’s a lot going on in Planetside 2 – infantry pushes, skirmishes, tank columns – all that jazz. One of the common problems I’ve run into in-game so far is understanding what’s being done at any one time. Call it the fog-of-war, if you want – if you’re dropping into battle, it would be useful to have a rough guide to enemy numbers, and how your side is doing. Planetside 2 tries a bit of that, but it doesn’t really work. The squads I’ve auto-joined don’t work together. The battles I’ve dropped into via the auto-deploy have been mostly a disaster. Once my drop-pod landed inside a group of seven or eight Terran Republic players. That was exciting. The other problem – the on-screen HUD is icon spaghetti. There’s a lot for players to work out: from the positions of other players, objectives, vehicle spawn points, ammo refills… and it’s all displayed on the HUD while you play. I think what I’m getting at is that Planetside throws a lot of information at you; but does a pretty bad job of contextualising that information. Yes, the map shows me there’s a flashpoint over at that base. But why should I go there? Yes, there are three objectives to capture – but where are my team heading, and what’s resistance like. There are two approaches to this: the first could be for a clever automated helper system. Or you could get players to provide that info. A player led solution: where squads, platoon and outfit commanders can work together to provide a more complete picture to incoming players, would be my preferred solution – and I do think the tools to provide that info are in the game. They’re just a bit hidden. And hidden partly within the progression. So lets talk about progression and meta-game. How do you get better in Planetside? Julian: Well, simply being in game accumulates points that can be spent on upgrades to your class and getting kills with guns speeds you towards unlocks of new equipment. It’s all a little confusing. It’s not like in, say, Call of Duty where the unlocks are laid out before you in a linear stream and after six kills with the Assault class’ machine gun you receive a reflex scope. Instead, you accumulate points and then spend them on the upgrade you want. This is both good and bad. On the one hand you can drive your points into the upgrades you want, on the other I quickly forgot I was earning points and so was using the bog standard guns for a long time. Nick: They made a huge change in the beta by removing Auraxium as a resource. This used to govern all your upgrades relating to weapons. They then removed it, instead making everything available to cert points. I was a bit critical at first, as I thought this would slow your progression down since cert points would be used for everything. But upon playing a bit more It does make a whole lot of sense, making it easier for people to understand how much their putting into their progression. Having the two resources beforehand made things confusing to newer players. Now you just earn cert points everywhere as a result. Leveling up gives you certs, capturing bases gives you certs, killing people gives you certs. Even being offline gives you a passive cert gain. Go play Planetside 2, and you will progress at the pace you play. And what are you investing your cert points in? Tim: I’m enjoying playing as the Light Assault class – mainly because he comes with a free jetpack. What the jetpack’s useful for is getting into flanking positions on enemy troops, and then dropping grenades on their faces. Which is fun. But that’s not where I’m spending my certs. I’m actually saving them to spend on Reaver stuff. The Reaver is the NC’s combat VTOL aircraft. And I bloody love it. I’ve just about got the hang of dogfighting and swooping in for bombing runs, and I’m starting to do some decent damage. The fun part of playing at pilots at Planetside is the moment when you and two friends start chasing down an enemy. I just had a lunatic Vanu try and escape through a hole in a giant skyscraper thing. While the others followed him through the gap, I just waited for him to try and loop round the back. He wasn’t expecting that. When it worked out, I gave out a little yelp. And there we go again. More war stories. Julian: I’ve been playing as an Infiltrator, the sniper class, so I’ve been putting a lot of my certs into the stealth suit. You can extend the time you can stay cloaked, as well as speed up the energy regeneration (nifty for getting yourself between crags and buildings unseen). Currently I’m utter pants at the vehicles – except for the Vanguard, I rock with the Vanguard battle tank. I accidentally ended up leading a tank column one night and with a crew of engineers behind me we were able to take two outposts – so I’ve been steering clear of putting certs into them. Soon though. Nick: I’m thinking of going heavily into Infiltrators and Engineers. On the ground I love to snipe and scout out the battlefield. It’s been a love of mine in most FPS games and Planetside 2 caters to me perfectly. The Engineer comes in when I’m teaming up with a MAX suit, usually taking out pesky aircraft or storming into an enemy building. They are also vital for my second love, flying. I love piloting all the aircraft available, each able to contribute in some way. Reavers for escorting and taking out other aircraft. Liberators are fantastic at destroying enemy armour placements. But the ship I love the most are Galaxy’s, because I feel like a bus driver. Mind you, it does involve the safe keeping of up to eleven other people as you fly into the frontlines. It’s things like that though that create the best stories, risking it all and performing great feats in combat. Spoiler: It’s usually just my jammy luck as well. How do you think the free-to-play stuff is working right now? Does it make you happy? Sad? Have you bought anything yet? Tim: Full disclosure – I’ve been granted a press-account with six month’s worth of membership. However, before the launch, I coughed up for Alpha Squad – a set of bonus guns and experience boosts that also came with a wodge of Station Cash – the in-game currency. I’m pretty happy with how that worked out and I think that I was playing the game as a punter, I’d probably have spent a bit on experience boosts. If Planetside has a fault, it’s that the grind to earn certification points is mahoosive – I’m genuinely astonished at the cost (in terms of player time) of some of the unlocks. For that reason, I’ve already started throwing money at unlocks for my beloved Reaver in the form of Anti-Air Missiles. Earning those via in-game unlocks could take days. I don’t necessarily think Planetside 2 is pay to win. But I do think it pays to pay. Julian: Hmm. I’m not too keen on it. The crawl to upgrades is punishing. I feel like having a decent spread of unlocks is out of my reach without paying but because I’m disappointed by the grind I’m already out of the mindset of giving the developers money. Nick: Don’t get me wrong with how I described certs above, you’re going to be playing a lot of Planetside 2 if you want your upgrades without shelling out the cash. I’ve seen a lot of veteran players already going into Planetside 2 with tens of thousands of “Smed Bucks”, ready to get everything they need to play comfortably. But should we need to pay money to play comfortably? Right now If I pick up a Reaver and I get into a dogfight with a Sycthe/Mosquito who have upgrades such as AA missiles, I’m at a disadvantage. This doesn’t mean I will lose to them every time; certainly not on a few occasions with some help of the scenery. It does mean they have more options available to them though in situations like the above. Tim: Honestly, there’s loads I’d change. I think the resourcing mechanic is a bit lunatic. I think the way you capture and hold territory is strange and befuddling. I’d want much more customisation of a player’s face and body. I’d do more to differentiate the New Conglomerate and the Terran Republic. I’d have a weekly set of weapon unlocks so every player can try some of the higher end weapons – like how League of Legends opens up a new palette of heroes every day. 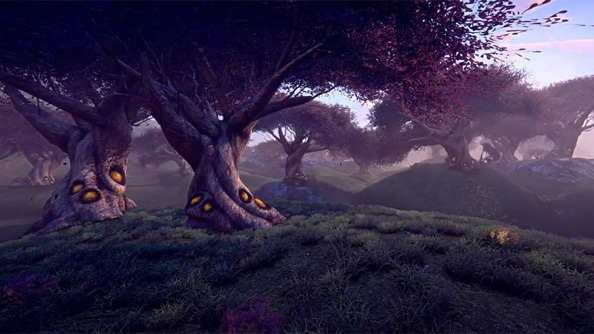 Planetside 2 is a quirky, shonky, messy, brilliant game. I’ll forgive it everything for those war stories. I think I’m going to play it forever. Julian: I’d love something on screen to indicate your cert progress, something to remind me that I’m earning them and should be spending them. It’s very superficial but I’d also like something a little more bombastic for when I get a kill. That would make me feel warmer and fuzzier. The main issue I currently have was touched on by Tim. There are so many players in the game (which is ace) but there’s little organising them (which is boo). It’s complete luck to stumble across people who are actually playing together and more often than not you’ll have 30 guys milling about in cover behind a rock outside a base waiting for someone to break and run into the enemy outpost first. Nick: Certainly. Include more ways of gaining certs for a start. Something like weekly or monthly achievements that reward you for doing something amazing. Did you just take a missile to your Reaver, saving the life of twelve fellow soldiers in that Galaxy; here have some extra cert points! I could go on and on with more ideas for achievements, but you can do that on your own. Planetside 2 should reward skilled players, but they should also reward those that show bravery, selflessness and valour.